Sgt. 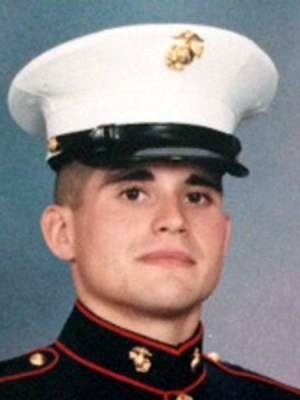 Robert Drelich, USMC, 31, of Wallington, passed away on May 29, 2014 while stationed at Camp Lejeune, Jacksonville, NC. Born in Passaic, he lived most of his life in Wallington and was a parishioner of Holy Rosary R.C. Church, Passaic. Robert enlisted in the United States Marine Corps in October 2004. He attended and completed the School of Infantry as well as Marine Corps Security Forces Training. He has been stationed in Rota, Spain, Twentynine Palms, California and Camp Lejeune, North Carolina. During his military career, he has been deployed to Lebanon in 2006 as part of a Joint Task Force, Iraq in 2008 and Afghanistan in 2009. In 2010, he served as an Instructor, training Marines being deployed to Afghanistan. On his last deployment to Afghanistan in 2011, he served as Personal Security for the commanding officer. His selfless service is deeply appreciated and will never be forgotten. The entire family would like to thank extended family and friends for their loving support. A special thanks goes to all those he served with over the years as well as Wounded Warrior Battalion-East and all the Marines and Staff that have given him their understanding, endless patience and steadfast help. Beloved husband of Susan E. (Palm). Devoted son of Jozef of Wallington and the late Lucyna (Chalupnik) who passed away in 2009. Dear brother of Gregory and his wife Joanna of Saddle Brook. Loving uncle of Gregory and Jakub. Dear grandson of Kazimiera Wielgo of Clifton. Adored Godson of Edward Chalupnik of Garfield and Sophie Bednarz of Clifton. Cherished Godfather of Michael McManus. Loving nephew and cousin to many. Funeral Saturday 8:30 AM at the Shook Funeral Home, 639 Van Houten Ave., Clifton, and 10 AM at Holy Rosary R.C. Church, Passaic. Interment, St. Mary's Cemetery, Saddle Brook, with full Military Honors. Visiting Thursday 7-9 PM and Friday 2-4 and 6-9 PM at the funeral home. An additional memorial service will be held at the Saint Francis Xavier Chapel on Camp Lejeune in North Carolina on June 17th at 1:30 PM. At the request of the family, donations made to the Injured Marine Semper Fi Fund, 825 College Blvd., Suite 102, PMB 609, Oceanside, CA 92057, www.semperfifund.org in memory of Robert, would be greatly appreciated. Robert Drelich of Wallington wanted to join the Marines so much after high school that he worked out until he was able to shed 150 pounds to qualify. He finally fulfilled his dream and in quick succession was posted to Lebanon, Iraq and then Afghanistan. But with nearly 10 years in the Marines, Sgt. Robert Drelich began suffering from post-traumatic stress disorder and a shoulder wound that required surgery. His injuries forced him to join a battalion of wounded Marines near Camp Lejeune, N.C., six months ago. On May 29, Drelich, 31, died at the North Carolina home he shared with his wife, Susan. The military is investigating the cause, but his brother, Greg, who is a Garfield police officer, said Drelich’s death was related to his heart. He will be buried with full military honors Saturday at St. Mary’s Cemetery in Saddle Brook. Greg Drelich said his brother was preparing to leave the service in July and decided to attend a law enforcement job fair in Raleigh, N.C., on May 29, the day he died. He thought he might try for a job as a police officer in North Carolina or in New Jersey. If that didn’t work out, he was going to return to William Paterson University to finish his teaching degree. “He’s a humble guy who served his country proudly,” said Greg Drelich, who is the older brother by eight years. Born in Passaic to Polish immigrants Jozef and Lucyna Drelich, Drelich played football and ran track at Wallington High School. But it wasn’t until after he graduated that he seriously began to consider the Marines. That’s when he started running regularly, working out and eating less, and eventually got down to 180 pounds. Despite the dangers, he chose the Marines because they were on the front lines, his brother said. Drelich enlisted in October 2004 and was deployed to Lebanon in 2006, Iraq in 2008 and Afghanistan in 2009. In 2010, he was assigned to train Marines who were about to leave for Afghanistan. During his last deployment in Afghanistan in 2011, he served in a personal security detail for the commanding officer. Greg Drelich recalled his brother’s vivid descriptions of war: “The bodies, people blowing up in front of him. Friends losing limbs, lives. That constant fear, that has to take a toll on you,” Greg Drelich said. Hours before Drelich died, he was sharing funny videos and jokes on the computer with Abatangelo. “I had no idea that was going to be the last time I had any dealings with him,” said Abatangelo, who heard the news of his friend’s death that morning. “My conversation with him was still up on the computer,” he said.